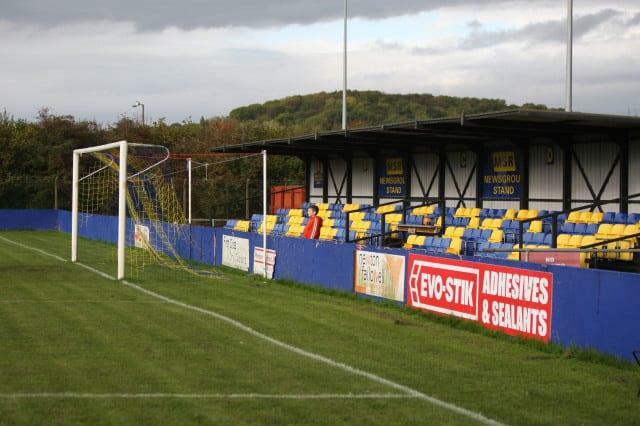 Carlton Town’s relegation fears increased after a 4-2 defeat at Sheffield. Following the second half collapse against the Owls last week, manager Wayne Scott made two changes to the side. In came debutant Connor Green plus Henry Rollinson with Aaron Opoku and Ben Hutchinson both absent. Scott also switched to a 4-5-1 / 4-4-2 with Oliver Clark playing in an advanced role alongside of just behind Tyler Blake. Any hopes the new formation might get off to a solid start went up in flames as Club took the lead after just 32 seconds. They attacked down the left from the kick off and when the ball was played into the area Ted Cribley fired home unmarked. Carlton hadn’t even touched the ball. The Millers responded well on a good surface and Aidan Austin, playing in a more advanced wide left role, burst down the flank and crossed only for no-one to get a final touch. It was to be a recurring theme. Home goalkeeper Jonathan Hedge made a fine save to prevent a Blake header from netting on 13 minutes as the Millers put the hosts under some pressure. The home crowd, no doubt expecting a goal-fest after the first minute, were growing restless but they were almost celebrating a second goal on 20 minutes when Marc Newsham saw his shot hit the post. With five minutes remaining in the half Hedge fumbled a Kieran Walker throw-in but no-one was on hand to take advantage. Scott brought on Kyle Stovell at half time and the move should have resulted in an equaliser 30 seconds into the second half. Stovell controlled a pass into the area, found space but his cross-shot was missed by Austin at the far post with the goal gaping. The equaliser though arrived on 52 minutes. Green, having an impressive debut at left back, lofted a deep ball towards the penalty area. Stovell stole in between the centre-halves and, with Hedge stranded off his goal line, the striker dinked a deliciously soft header over the keeper and into the net. It was a delightful finish. 60 seconds later Carlton were desperately unlucky not to take the lead. Robbie McNicholas hits a superb cross from the right which Blake headed goalwards. Hedge was beaten all ends up but the ball cannoned back off the crossbar to the dismay of the travelling support behind the goal. The let-off seemed to wake up the home side and Cribley saw a deep cross well saved by Jack Steggles. The next goal was always going to be pivotal and Carlton’s recent defensive lapses gave the visiting supporters no cause for optimism. So it proved when Club regained the lead on 67 minutes. Steggles was unable to hold a ball in from the left and Richard Patterson was on hand to fire home from 12 yards. Straight from the kick-off Carlton should have equalised. The home defence got into a horrible mix-up trying to clear a harmless-looking ball and a ricochet put Stovell clean through on goal. With just the keeper to beat he fired over the bar. 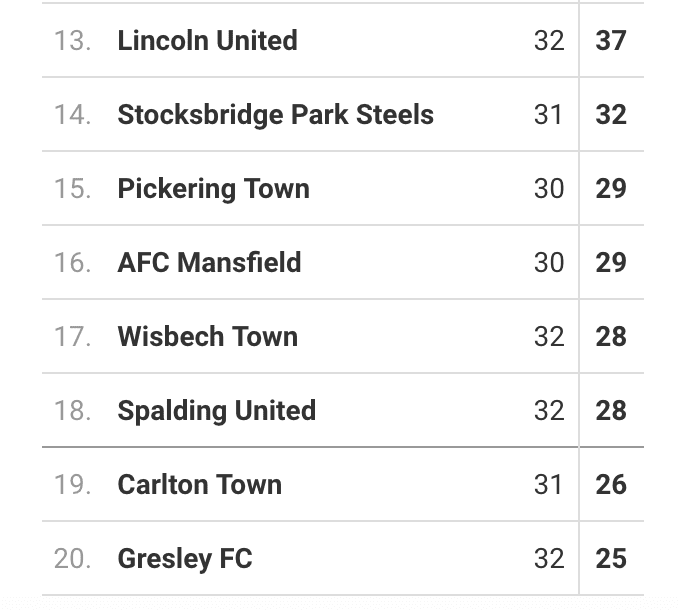 Sheffield took full advantage and secured the win, just as Cleethorpes did, with two late goals. On 84 minutes a cross from the left was only half cleared and substitute Jamie Yates fired into the top corner from 20 yards. Three minutes later it was 4-1. Oliver Clark had seen a shot saved by Hedge. Sheffield moved on the attack straight away and Mitch Dunn found himself with far too much time and space to fire home from a central position. The scoreline was harsh on Carlton, who in different circumstances could have won the game, but the continued leaking of multiple goals is going to get them relegated. It was by no means the worst of performances and on another day might have gained a result, but the opportunities to have those “other days” are fast running out.